There are two Stanford essays – a personal essay that seeks to understand who you are as a person, and a second essay which asks “why us?” Stanford suggests dedicating 750 words to the first essay and 400 words to the second, totaling 1,150 words. Because this is a suggestion and not a hard cutoff, we believe that you can go up 10% from the 1,150 count – but any more than that would not reflect well on your application. 1,275 words should be plenty to get your points across. We also suggest allocating the extra words to the first Stanford essay, and you’ll soon see why. Essay 1: What matters to you most and why? Writing the first Stanford essay is almost as hard as getting into Stanford. It is by far the hardest MBA essay to write. Why? There are a few reasons. The first is that it is open ended. There is no specific piece of information or clue in the prompt to help steer you in the right direction. The second reason is that this essays needs to be honest and genuine – if you’re not communicating who you are, you haven’t done your job. It’s not so much about “sounding good” but rather, it’s about engaging the reader and connecting them to your life and values through a unique story from your life. If you think it’s easy to demonstrate character through writing, think again. The third reason this essay is difficult is that it needs to be creative. It’s not just about the content or the “what” of your essay, but the angle through which you choose to tackle your story. Fourth, it needs to demonstrate values that resonate with Stanford like leadership, personal contribution, and intellectual integrity. Not that every essay should conclude on this note, but it is good to have these in mind and see if you can incorporate them. And lastly – the true difficulty of this essay is that it has no rules. What has been done in the past isn’t a precedent – on the contrary, if it has been done, you probably shouldn’t repeat it. Hopefully, you made it to this second paragraph. The idea is not to scare you off – but to make sure you’re thinking along the right lines for your essay so that you don’t waste your time. Such an essay requires deep, mature, self-examination so you can genuinely illustrate who you are and how you became that way. (1) It’s an essay that needs to be written with honesty and from the heart. A general rule of thumb we like to give our clients is that your writing subject should matter to you. If it doesn’t matter to you, why should it matter to anyone else? Moreover, if it doesn’t matter to you, it probably wasn’t an impactful enough experience to take the Stanford Essay throne. (2) This should be personal, and not professional. This isn’t an essay about what you accomplished professionally, but rather, how you grew; where you struggled; and how you persevered. If you had a very powerful professional experience then you can write about it, but make sure that the angle stays personal. It’s not about what you accomplished for the company, but how you overcame your own demons and how you grew within a situation. Another way to think about it is: if you choose to go professional, the professional aspect should be merely circumstantial, but not the subject of your essay. (3) Do not write about a book you read or philosophize about ideals. This is not a manifesto of hifalutin rhetoric; the essay is qualitative and artistic, and should be story based. (4) Did we say story based? That’s because we mean, story based. The reason people love books, TV, and movies is because we get to share in someone’s world for 300 pages, once a week, or for 2 hours in the theater. Stories are a good way to both truly demonstrate the situation while drawing the reader in. We recommend leading the essay with a defining or life changing moment or event. The “easiest” stories to use are tragedies – overcoming an illness, losing a loved one, bankruptcy, etc. These are go-to’s because they immediately put the person in a trial which they have to overcome – the way the person overcomes that trial is what demonstrates character. (5) Obviously tragedies are not the only topics to write about. If you volunteered in Africa for a year that will probably be the subject of your essay. But remember: it’s not a dry narration. Once you have your topic, you will need to think long and hard about how to angle your story so that it is most powerful. In other words, if you’re lucky enough to never have experienced a tragedy, you just need to think creatively. For example, we’ve seen wonderful essays on leadership or on three big decisions one candidate made and where each decision led them. Because it’s not just about the “what” it’s also about the “how”. If you find an awesome way to talk about something, that’s half the battle. Again, the point is – the essay should demonstrate who you are and how you became that way. So find a few moments that were meaningful to you, and find a creative way to tie them together. (6) Do not try to write something that you think they want to hear. Phony essays are painfully dull to read because they are generic and empty. Write about something that you’re passionate about. At the very worst, you will write about something only you care about and you will have taught the reader something new. Powerful writing is honest writing. (7) The structure we suggest is to open with a personal story and then demonstrate the aftermath; how did that moment influence your life and what did you learn. Ideally, this will serve as the bridge between who you are and why your career goals are what they are (Essay 2). This isn’t a must, but it can be a nice touch. (8) Take your time with this essay. Don’t rush the topic, the brainstorm, or the submission. Besides the fact that these take some time to weave together tightly, you also run the risk of growing callous to your story after reading it over and over again as you write it. So it would be wise to give yourself some time between the writing process and the submission. This way, you can take some distance from your work and return to it with fresh eyes. If, when you come back to your document, you think to yourself “wow! I wrote this?” then you’re on the right track. Hopefully, those tips give you some inkling as to the vibe and essence of the Stanford essay. Unfortunately, it’s very difficult to give more of a recipe for it; you just have to go with your heart, your brain, and your intuition. Did the reader get goose bumps at the end? Did they feel empowered? Did they feel uplifted? Did they feel moved? Did they feel you? Then you did your job. That is perhaps the only way to measure the “je ne sais quoi” element this essay requires. This essay is much more straightforward. This question is your classic career question. Stanford wants to know what your short, mid, and long-term goals are and why Stanford can help you achieve them. You have about 400 words to show that you know where you’re going, that your path is sound, and that Stanford can help you get there. As mentioned above, the beginning of this essay 2 should ideally be a continuum of essay1. When building your career path, your experiences should have some relation to what you want to do, even if at first glance it seems indirect. 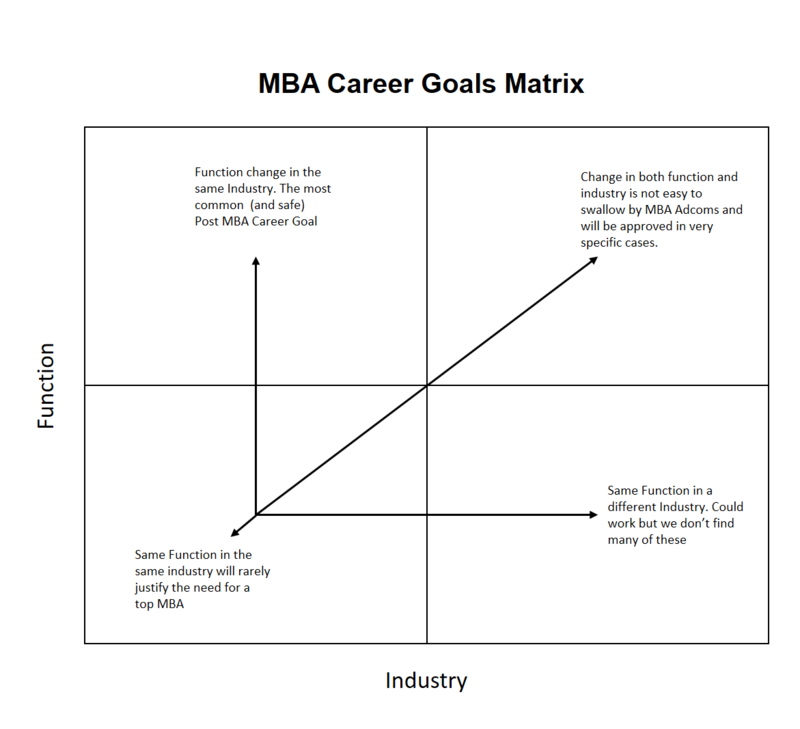 We created a “Function x Industry” matrix to help you test the legitimacy of your short-term goals. The last part of this essay should address the question “what do you hope to gain professionally at Stanford.” Your answer to their question should reflect all the specific opportunities that you’ve researched about Stanford that can help you bridge the gap between your current situation and your short-term goal of your career path. Thus, your answer should be tailored to the courses, clubs, recruitment opportunities, professors, programs, and any other offering at Stanford that will help support your career path. Leave nothing to the imagination of the admissions committee regarding how Stanford’s program can be beneficial to you. Also, be careful of being vague or general. Try to go beyond the first Google-able fact you find to actually paint a picture of what your two years will look like at Stanford considering all of their opportunities. Lastly, you should show that you will take advantage of the more socially oriented opportunities at Stanford. This will demonstrate that you also understand the importance of campus life and that you will be a good fit for the social student body. 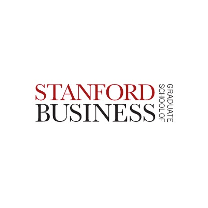 Want to learn more about applying to Stanford Business School? Our Stanford MBA page has all the application info you’ll need. For more about applying to MBA programs, our Top MBA school pages contain all the application and admissions info you’ll need to apply. 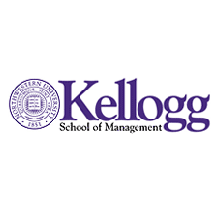 Interested in getting in touch with one of our MBA consultants? Contact us to set up a free MBA consultation.